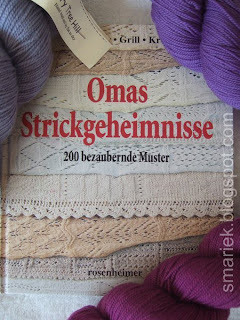 I've been wanting this knitting book, Omas Strickgeheimnisse, for quite some time and finally got my hands on one. :-) You can see it above with some sock yarn in my favorite colors. You can see the other 11 colors here, also beautiful colors, but the purples are my fave. This is definitely a fine addition to my stitch dictionary collection. My Barbara Walker Treasuries, Harmony Guides, and other books all shifted to make room and welcomed this newcomer amicably. Flipping through the pages of this book brings me joy. It is mostly filled with lace . It doesn't have a whole lot of what I'm into (cables) or even plain knit/purl stuff. I will face some challenges if I ever attempt to use this book as it is written completely in German and charts only (not that row-by-row instructions in German would help me). One more thing. The chart symbols are unlike the more familiar ones I am accustomed to (viz. BW & HG). We recently switched from Comcast (cable tv company) to this Direct TV (dish tv company). Besides a roughly 30 USD (not counting "mystery" charges that are always tacked onto the bill) monthly savings, I was really expecting them to be same shishkabob different texture. I was pleasantly surprised to discover that I now get BBCA, which I did not get with my "peasant" cable channel lineup before. Yay! So in theory, this means I should finally get a chance to watch this Doctor Who spinoff, Torchwood (UK link here) which I've been wanted to watch for a long time. Unfortunately, I didn't see the show coming down the pike in the next couple of weeks so I guess we're off season right now. Boo. However on the upside, I did discover that I can finally watch this British car show, Top Gear. I love this show, it is such a hoot to watch due to the highly amusing British commentaries that you don't find in American car shows. Now I need to figure out what other shows I should watch on BBCA... suggestions? There's a bit of disappointment about the Knit Picks Options set I got in December. No no, nothing wrong with the needle tips or cords themselves. I'm talking about the zipper bag that came with the set. The zipper broke apart. It wasn't the denticular part or the zipper pull tab. 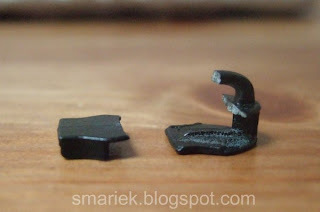 It was the small part that slides back and forth (see photo above). The breakage came as a surprise to me since I hadn't had the bag very long and it only had very light usage. I've probably opened/closed it less than 10 times. I've never had a zipper break on my this way before -- not in any of my toddler's clothing, or with any of my own bags or clothing, and they've all gotten way more wear and abuse than my new Knit Picks Options plastic bag. The left part should connect to the right part where the green and blue arrows point. There was a small piece broken off where the red arrow points that should connect to the left part to complete the "loop" to hold the zipper pull tab. I don't know where that very small piece went, prolly fell on the floor and crawled under the sofa to join the dust bunnies and whatever crumbs my toddler dropped on the floor. I couldn't leave all the contents in the plastic bag now, with the bag wide open. Let's not tempt fate here. I can already see my toddler inverting all the contents onto the floor! So off I went for a makeshift Knit Picks Options set holder. I fished out an old zippered CD case that had the capacity to hold 20 or so CDs and put all my Knit Picks Options tips & cables into it. It's not exactly the best solution, but it will do. The tips are pretty snug when they lay horizontally and won't slip out. I am happy with my Knit Picks Options needles. I am using the 8 mm (US11) needles for the red cable bag handle, and the 5 mm (US8) for my SIL's St. Albans Valentine Cable Scarf. The only trick is making sure I screw them on tight, cuz I've had them unscrew/loosen on me while knitting. I personally love the show Cash in the Attic on BBCA. Oh and the Graham Norton show, he is hilarious (though better to watch after Miss M is asleep! Which is very likely since I think his show is on only really late now). Oh and How Clean is Your House? and Bargain Hunt. Fluff shows but they are amusing. I love Oma's Strickgeheimnisse. I love saying it, too. I wonder if KP would replace the bag? You really haven't had it long. Marie, I love the Oma book too. Do you have a translation key? The charts are great, some stitches I have never seen anywhere before this book. I have one of the original copies, I'm so happy to see it back in print and I can't wait to see what you do with some of those stitches. Jeremy Clarkson is great and Graham Norton is hilarious. See if you can get Friday Night with Jonathon Ross. He's very good. I bet KP would replace the bag for you. They have pretty good customer service and you haven't had it that long. I've never seen a zipper break like that either. Weird. I like Dr. Who on BBCA. It can be kind of fierce, so make sure Missy isn't around too much if you check it out. I Tivo Cash in the Attic and Bargain Hunt on BBCA, then knit to it later. If I Tivo it all, I can fast forward through the commercials. The interesting thing is that they typically have the same 3 or 4 commercials for each show...over and over and over again. 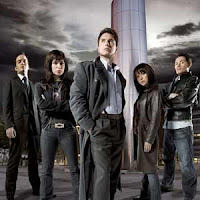 The only show I really watch on BBCA is Torchwood, and you already mentioned that. Apparently there's a pretty cool mini-series that should be coming out soon, though I can't remember the name! I'll let you know if I do. That is really odd with the zipper breaking like that. You could contact KP about it since you haven't had it that long or you could knit yourself up a little bag for it if you want to. I found a crocheted hook case on Ravelry that I bet you could get inspired by and knit a needle tip case. It would be unique. On BBCA, there are still Doctor Who reruns available, not in the same sequence that are at SciFi Channel. You can get Torchwood episodes at iTunes for $2 each; I've got both of the first 2 seasons on DVD. LOVE this show! The upcoming season will be just 4 or so longer episodes, rather than the usual 10 or so. You might also want to look at 'Life on Mars' and a new sort of spin-off called 'Ashes to Ashes'. I've seen the KP zip case and didn't think much of it. I bought some of the 2-per-page things for the KP ring binder set and put them into a 3-ring binder I already had. The spacing of holes isn't perfect, but it was easy to fix that. I wrote on the purple end caps with the size in US and mm, and one is in each section with the needles of that size. The cords fit well in other sections, also marked with the length. Your solution with the CD case is clever! It's been ages since I have had the BBCA channel. The shows we used to like to watch were Coupling, Antiques Road Show and I was going to suggest Cash in the Attic, but I see other's already have. Great minds and all that. And last but not least Monty Python, of course. I'm so glad you were finally able to get a book you have been wanting. It's such fun when that happens. I agree with you I prefer working cables to lace. Torchwood! I just discovered the show myself, having wanted to watch all four seasons of Doctor who first. I highly recommend renting/borrowing the DVDs for the two past seasons before season 3 starts in April! It's so great, isn't it! 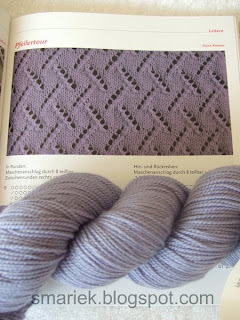 If you have the receipt from the purchase, KnitPicks will likely replace the item. Although I've had a few small problems with my needles, their customer service is terrific. One time I didn't have the receipt, and the lady on the phone looked up my order number for me and told me to write a letter with items I wanted to exchange. It was after the 30-day limit (or whatever it is, I've forgotten), and since I hadn't used the needles and wanted to exchange them for a different size, they didn't charge me a restocking fee NOR another shipping charge. Worth a phone call, no?